UPDATE (April 11, 2018) The Bill Hybels controversy was trending today on Twitter, along with Paul Ryan and Kevin Spacey. Rev. Hybels, the pastor of Willow Creek Church, one of the largest and most emulated churches in the country, retired last night, months before his planned retirement later this year, as a result of the controversy regarding sexual accusations. Newspapers and websites were quick to chime in. Chicago Tribune, ABC, USAToday, Washington Post (by my friend Sarah Pulliam Bailey) The Blaze, Time, Newsweek, HuffingtonPost, CBS and pretty much every other agency including Christianity Today and World Religion News. Twitter was ablaze. The story trended. The Womens’ Stories Are Not Yet Fully Told - There can be no healing until the truth is all brought into the light. I know you don’t want to hear this…..but there’s more to come. And we must not ignore the voices of these women or they will be abused all over again. Bill Hybels is not the victim here! There Can Be No Healing Without Repentance – Last night I heard no confession of deceit or admission of guilt for sexual misconduct. For the church and its leaders to move on there must be full ownership of what was sinful and flawed in the process. Only then can we hope for healing and restoration, for light to come from the darkness. UPDATE (April 10, 2018): Bill Hybels resigns. 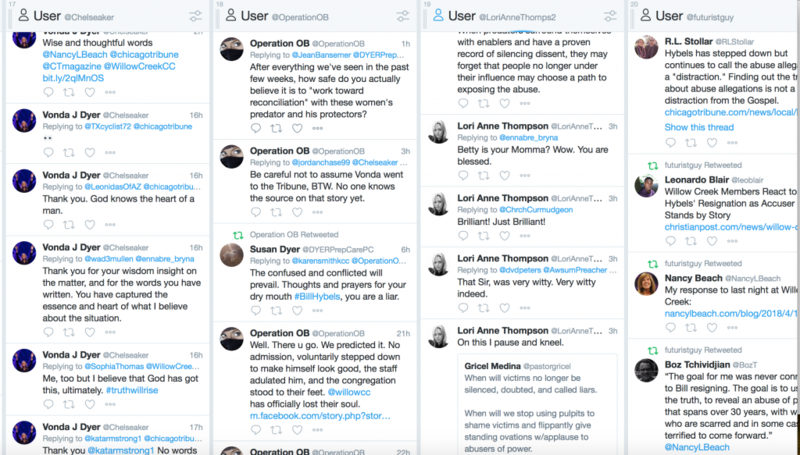 The controversial story about Willow Creek church and Bill Hybels has shifted over to Twitter where women are finding their voice, some of them alleged victims, some of them daughters of the accusers, some of them long time Creekers who are now speaking out. This came as a shock to me. I have always admired Willow Creek. Willow was the one church many of us young pastors would have given our right leg to work for. And Bill Hybels has been a perennial example of how to lead well. The last time I mentioned him I said this . 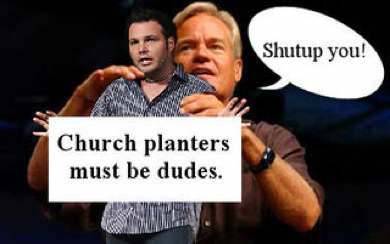 . .
Before that, I mentioned Bill Hybels giving Mark Driscoll a hard time about his view on women in ministry. 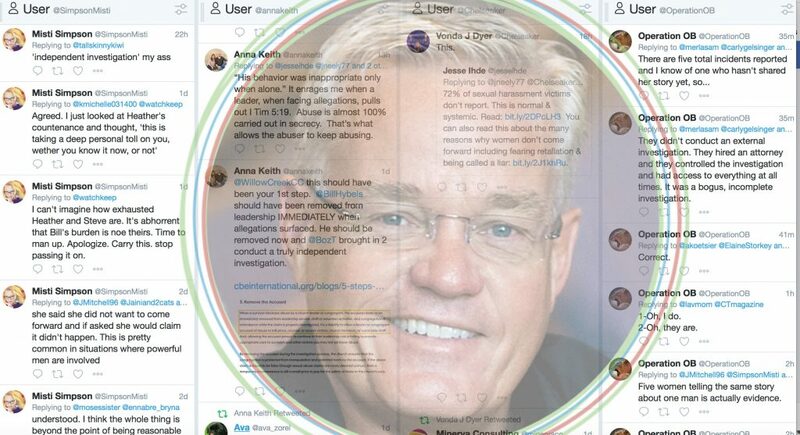 But now it appears that Bill Hybels might be facing his biggest challenge yet – not to build an awesome international ministry and impact thousands but rather to face the controversy in his own church regarding his relationships with staff members, and to do so with humility and submission. If you haven’t followed the story, the big articles were the Chicago Tribune and Christianity Today. The best blog posts, I think, have been The Wartburg Watch and this morning Dan Brennan wrote an insightful post on gender equality in egalitarian churches.
. . . Bill Hybels, who co-founded Willow Creek, one of the nation’s largest churches, came under the spotlight last week after the Chicago Tribune published a series of allegations that he made suggestive comments, extended hugs, an unwanted kiss, invitations to a staff member to hotel rooms and had a consensual affair with a married woman. The woman who said she had an affair later retracted her allegations. Hybels denied all of the allegations in an interview with the Tribune. The church conducted its own internal review, and an outside attorney who investigated the allegations told the Tribune his work led to no findings of misconduct by Hybels. In the Tribune’s report, other high-profile evangelical leaders, including John and Nancy Ortberg, suggested that the church’s internal review of the allegations was inadequate. But after Hybels responded to the allegations to his congregation, calling them “flat-out lies,” he received standing ovations. 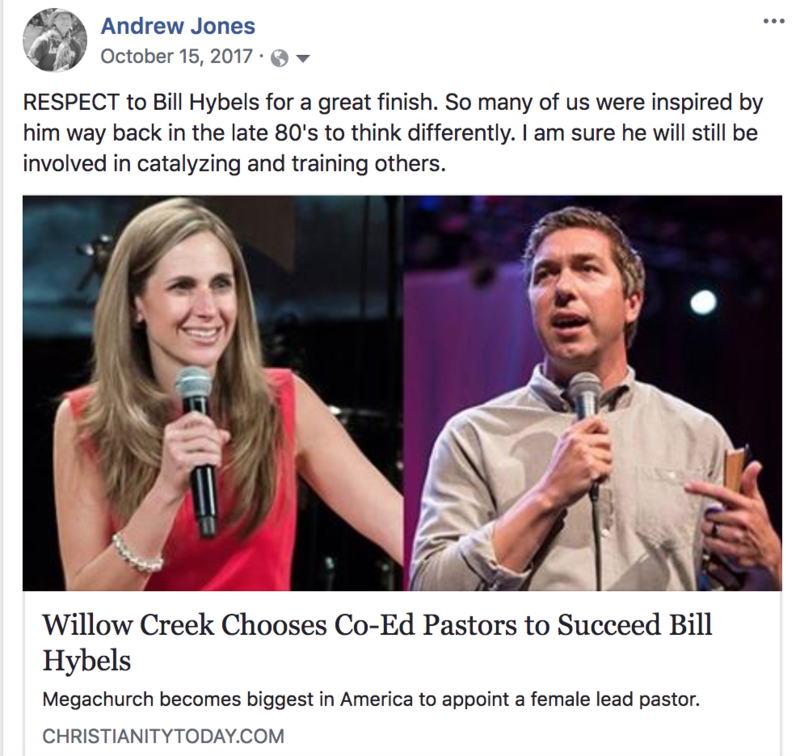 Willow Creek responded to earlier newspaper articles with a statement and two “family meetings” where Bill Hybels defended himself [video] and has been “cleared of misconduct”. He has garnered a huge amount of support. But there is also a huge amount of disagreement and doubt, most of it now on Twitter. Here’s a quick summary of the conversations this week, the unanswered questions and why the discussion continues. When a pastor claims to be completely innocent of every allegation from every accuser, and that pastor is not Morgan Freeman :-), people get suspicious because we are all human. When a church that has been esteemed as a leading light for gender equality in the egalitarian movement is criticized for unequal power plays, people suggest that an egalitarianism which does not move beyond the church stage towards shared power in one-on-one relationships is only skin deep. When someone knows less about a 4-year long controversy in the church they have been attending every week than their non-church-going neighbor, who got up early to read the local newspaper, people feel disrespected, untrusted, and stupid. When the investigator retained to indiscriminately examine the claims of all parties lists his experience as defending or representing employers (10) and defending or representing victims (0), people fear that victims might not have been heard or validated. When the investigative team announces they have found absolutely nothing there, as they look up from the pastor’s email inbox folder, people wonder why nobody looked for those 1150 emails on the recipient’s computer. When the church’s PR guy from last year’s controversy was the same person who coached Mark Driscoll in how to defend himself against accusations, and they don’t want to name the new church PR person for this inquiry, people wonder who is actually doing the talking. When Boz Tchividjian of GRACE (Godly Response to Abuse in the Christian Environment) casts doubt on the church’s attempt at an investigative process as thorough, objective, and independent, the call for a second investigation does not sound far-fetched. When discernment bloggers who have tracked church abuse controversies through the past decade say they smell familiar smoke coming from a church’s fire, recent precedents are triggered, echoes are heard, patterns are detected, suspicions are aroused. When the guy on stage hugging your pastor and causing a standing ovation is the same guy blocking questioners on twitter a few days later, and church members say they refuse to read the papers because they believe their pastor, critics see blind loyalty. When the pastor is accused of throwing people under the bus, people wonder if the church they have loved and admired is now becoming more concerned with self-preservation of the powerful than ministry to the vulnerable. When the chair of the elder board claims that a group of malcontents are conspiring to tarnish their pastor’s reputation, and no one can find any evidence to support it or motivation behind it, and that the accusers have nothing to gain except a clear conscience, and the children of the accusers are backing up their parents on social media, people wonder whether the concerns of that group should be dismissed so quickly. So, this is a conversation that is just now starting to picking up steam but at the same time it involves a lot of emotional turmoil for people involved. I pray for them. And I pray for Bill Hybels. And I pray the truth of this whole situation will emerge so we can all move forward. Christian Feminism Today: Hey Bill Hybels - Where There's Smoke . .